I have to hand it to BedInABox (BIAB) for the amount of information provided for their mattresses. It is almost overwhelming. But the advantage to you, the consumer, is that you know what you are ordering. This is especially true for Purity, the top-of-the line BedInABox model. The designation of 100% Natural applies to more than the latex in this latex mattress. It also applies to the cover and the fire barrier, as well as to the BedInABox foundation. 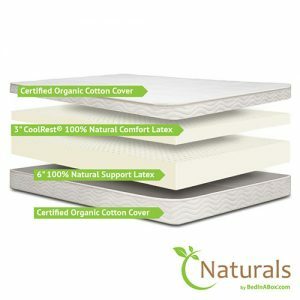 The two-layer core of the BIAB Purity mattress is 100% natural latex. This is foam rubber made completely from rubber tree sap. 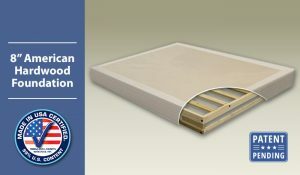 It is produced in a continuous slab process so that slabs do not have to be pieced together to make a mattress layer. The 6" lower layer is the support core. This is very firm for overall support for the comfort layer and the sleeper. Making it out of latex ensures that the entire mattress is natural, avoiding the out-gassing problems of polyurethane foam. The 3" upper layer is high resilience latex, trade-named CoolRest. Both it and the support latex below are made to be porous for ventilation and cooling. This comes in three firmnesses: Soft (11 ILD), Medium (19 ILD), and Firm (31 ILD). The customers choose their preferred level of support. The cover is a blend of silk and cashmere, both animal fibers. Silk is from the cocoons of the silk moth, first produced commercially in China over 3,000 years ago. Cashmere is the undercoat hair of the cashmere goat, originally bred in the Kashmir region of India and Pakistan. Both of these have historically been luxury fibers. The flame retardant is compressed wool, a natural alternative to toxic chemicals such as boric acid. This accounts for the additioanl half inch of this 9½" high mattress. The foundation sold by BedInABox is an 8" high hardwood slatted box base with a natural fiber cover. Purity is also compatible with similar bases as well as platform beds and adjustable beds. The BedInABox Purity is sold directly from BIAB online or through affiliate retailers. Besides on it own site, BedInABox also list this all-natural mattress on Wayfair. Purity 100% Natural Latex Mattress with Cashmere & Cotton Cover is covered by a 20-Year Limited Warranty with 10 years full replacement. It has a 120 Night Zero Risk Trial.